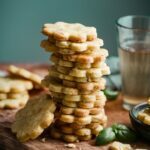 Apricot Basil Shortbread Cookies, a citrus shortbread with a touch of basil. In a large mixing bowl, whisk together sifted flour, sugar, and salt. Drop in your small cubes of butter and begin mixing together with your hands. Squeeze the butter and flower mixture, working until it resembles cornmeal. Add your basil, apricots, orange zest, and vanilla to your flour mixture. Lovingly work knead the ingredients together by had, mixing thoroughly to create a cookie dough texture. Form dough into a ball and wrap in plastic wrap. Preheat oven to 325 F (163 C) and line two cookie sheets with parchment paper. Remove dough from the fridge and slice in half. Place one half on a gently floured surface and roll out to 1/8 inch -1/4 inch thickness. Use your cookie cutter to cut out as many cookies as you can. Bake for 12-14 minutes or until edges start to golden in color. Bake time may differ between ovens, so keep an eye on the first batch. Repeat with remaining half of dough. Set cookies on cooling rack for 10-15 minutes before serving.